The European Commission’s 2030 climate and energy package unveiled on 22January confines itself to two main proposals: a 40% binding greenhouse gas emission reduction target and legislative reform of the EU Emission Trading Scheme. Significantly, it does not include post-2020 national renewable energy targets or new energy efficiency targets. It also drops the fuel quality directive which underpins the use of biofuels in the transport sector. The upshot of the proposals, if adopted by the EU Member States and the European Parliament, is that the EU’s climate policy will in future be carried out almost exclusively through the Emission Trading Scheme coupled with national emission reduction targets. The days of micromanagement from Brussels are over. “A game-changer for investors in renewable energy” is how one analyst summed up the European Commission’s new climate and energy package, which aims to extend the EU’s climate policies beyond 2020 to 2030. This could well be true. Prior to the publication of the proposals it had already become clear that the Commission did not want to extend its 20-20-20 policy – which sets targets for emission reduction, renewable energy and energy efficiency for 2020 – into the next decade. Brussels fears for the EU’s international competitiveness. It is also worried by the fragmentation of the internal market brought about by national subsidy schemes for renewables. Nevertheless, the package did contain some surprises, and not very positive ones for many NGOs and businesses supportive of strong climate policies. The main proposal that Brussels wants European heads of state and government to endorse when they meet in Brussels on 20-21 March is a 40% greenhouse gas emission reduction target for 2030. The Commission did not decide on the 40% cut until the last moment: a protracted discussion over 35% versus 40% (compared to business-as-usual of 32%) delayed the press conference of European Commission President José Manuel Barroso, energy commissioner Günther Oettinger and climate commissioner Connie Hedegaard. The EU should “build and go beyond” its 2020 policies, Barroso said, first and foremost through a binding 40% greenhouse gas emission reduction target. This is the most cost-effective option according to the EU’s own low-carbon roadmap for 2050, he added. The 40% cut would be met “through domestic measures alone”. This means that a global climate deal in Paris in 2015 could lead to a higher figure if such a deal comes with the option of offsets, such as under the Clean Development Mechanism. The Commission also put forward a legislative proposal to introduce a “market stability reserve” into the EU Emission Trading Scheme (ETS) starting from 2021. This would add and remove allowances from the market based on a set of pre-defined rules, to tackle both the current allowance surplus and to protect the market from future shocks. But Brussels did not go much further than that. It proposes a binding renewable energy target of “at least 27%” of energy consumption for 2030”, but this will not be translated into national targets, because that would risk fragmenting the internal market and not be cost-effective, says the Commission. The 27% target is hardly more than the 24% “business-as-usual” number. It is also what a 40% emission reduction target is projected to deliver anyway in terms of renewables. In addition, the Commission announced there will be no new initiatives on energy efficiency until a review of the existing EU energy efficiency directive is completed in June. Perhaps most surprisingly the Commission also announced that it would not establish new targets for the greenhouse gas intensity of road transport fuels. This means there will be no requirement for oil suppliers to reduce emissions from road transport beyond 2020. Currently, they are required to reduce emissions from road transport fuels by 6% from 2010-20 under the fuel quality directive. What did stakeholders make of all this? There was certainly no shortage of reactions, from muted welcomes to stark warnings. “Commission against EU leadership: less growth, fewer jobs, more import spending”, announced the European Renewable Energy Council (EREC), which represents renewable energy industries. “If you wanted to shift investments further away from Europe, you would go about it no other way,” said EREC’s president Rainer Hinrichs-Rahlwes. “The Commission is weakening the EU’s international competitiveness and industrial leadership.” The renewables industry wanted a 45% target for renewables. In 2010, renewables subsidies (€27bn) nearly equalled fossil fuel import savings (€30bn), ), according to an in-depth energy prices and costs report that accompanied the Commission’s proposals on 22 January. The energy efficiency sector, represented in part by EuroACE, which represents companies providing energy saving goods and services to buildings (think Philips, Knauf Insulation etc) was no less scathing: “Excluding energy efficiency from the 2030 Package is to consciously choose NOT to boost our fragile economic recovery and to… renege on our climate commitments and reduce EU competitiveness,” said Adrian Joyce, EuroACE secretary general. It also ignores the views of the European Parliament, which called for a binding 40% energy efficiency target for 2030 as well as 40% emission reduction and 30% renewables targets, notes Joyce. A recent report from the German Fraunhofer Institute shows that without a binding energy efficiency target, the EU will not achieve energy savings beyond the business as usual scenario. Joyce and other efficiency advocates say a 40% binding target must now come in June when the EU reviews its energy efficiency directive. Unsurprisingly, NGOs too were unanimously disappointed on 22 January with their primary criticism being that the 40% greenhouse target is “out of line with climate science”, in the words of Jason Anderson at WWF. The target is based on getting to an 80% emission cut by 2050 with the goal of restricting greenhouse gases in the atmosphere to 450 parts per million and retaining a 50:50 chance of keeping climate change to within two degrees. This has been the starting point for the international climate talks. Yet NGOs say a 55-60% cut in 2030 plus targets for 45% renewables and 40% efficiency are needed to keep Europe on track. Not all the reactions were grim. Some got what they wanted. Eurogas, the association of the European gas industry, called the proposals “a step in the right direction” and said the 40% emission reduction target had been “a key policy ask”. It also welcomed the EU ETS reform (which will make coal more expensive in relation to gas). Electricity companies, represented by Eurelectric, were pleased too: “Importantly, both [the emission reduction and renewables] 2030 targets are EU-wide, allowing them to be met through a stronger ETS, rather than through a continuation of costly national subsidy schemes,” said Hans ten Berge, Eurelectric’s secretary general. “This could be a game-changer for investors in renewable energy, who will have to rely increasingly on the carbon price signal rather than on national support schemes,” agreed Marcus Ferdinand, head of EU carbon analysis at Thomson Reuters Point Carbon. 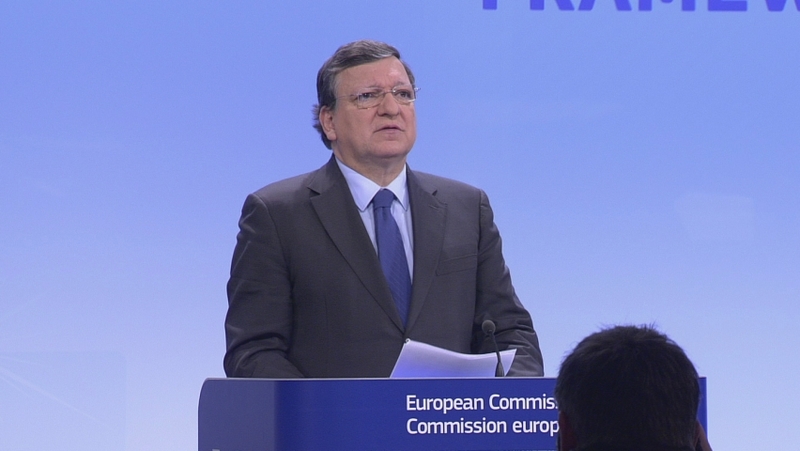 At the press conference Barroso came out strongly in favour of this market-driven approach, saying “renewables are not an end in itself” and that from an economic point of view, a single greenhouse gas emission reduction target would have made more sense. The 27% renewables target owes its raison d’être to politics, not economics, the Commission president said. The other news that elicited some positive reaction on 22 January was the proposed reform to the EU ETS. “In terms of legislative initiatives, the most significant element in the package is a proposal to set up a market stability reserve in the EU ETS,” judged Thomson Reuters Point Carbon. The proposal foresees allowances being released into or withdrawn from the market based on pre-defined rules based on how many allowances are in circulation (see Box at the bottom). According to Thomson Reuters Point Carbon, this new mechanism “should deal with the oversupply of allowances and create a steadily increasing carbon price averaging €35 between 2019 and 2030, boosting the carbon price by around €12 compared to business as usual”. They believe the reserve would grow until 2025, declining thereafter to cushion price rises. The International Emissions Trading Association (IETA) cautiously endorsed the idea as a “potentially interesting way of providing a more consistent price signal”. IETA is concerned, however, about the EU’s leadership on international carbon trading, with the Commission’s emphasis that the 40% emission reduction for 2030 should be purely domestic. Not everyone is convinced that the reserve will solve the problem of the current large surplus of allowances in the EU ETS, caused by the recession and an influx of international offsets. “This proposal will do nothing to address the massive oversupply of 2 billion emission permits,” believes Eva Filzmoser, director of the not-for-profit Carbon Market Watch. The Greens in the European Parliament called it “too little, too late” and warned that the flagship 40% emission reduction “would actually amount to a mere 33% reduction in reality, due to the failure to retire excess emissions allowances.” There is no proposal on the table for any permanent cancellation of allowances. That the Commission would not propose a new target for biofuels for 2030 was expected. That it would drop an EU goal to reduce the greenhouse gas emissions of fuels used in road transport – enshrined in the so-called fuel quality directive – was not. This is very bad news for biofuels. “Apparently, the current European Commission’s long term strategy [for decarbonising transport] is now formally not to have one,” said the Brazilian Sugarcane Industry Association (UNICA). Emission reductions in the transport sector should come from more efficiency, electric vehicles and advanced biofuels, the Commission says. So far its plans to mandate an alternative fuel infrastructure rollout (notably for electric cars) have run into firm opposition from member states however. And the fact remains that the non-ETS sector of which transport is a big part, will have to deliver a 30% emission reduction in 2030 – compared to just 10% in 2020 – under the 40% economy-wide proposal. The heating and cooling sector, represented by the Heat Coalition, was also very critical of the 2030 package, accusing the Commission of “a narrow focus on electricity”. Heating and cooling were not adequately taken into account, despite accounting for the largest share (>45%) of final energy consumption, the Coalition said. The proposals will now go to European heads of state and government who will meet on 20-21 March for a first discussion. No one expects an easy approval. Leaders will need to find unanimity to endorse the package, or at least the 40% emission reduction, which the Commission would like to take to Ban Ki-Moon’s climate summit in September as the EU’s offer for the UN climate talks. Poland is expected to the big blocker. “Raising the CO2 reduction target to 40% is at best premature,” said Polish MEP Konrad Szymański on 22 January. “The art of politics is to propose something that can actually get through,” Connie Hedegaard said on 22 January. Apparently the Commission believes that only a broad-brush approach, which lets industry and Member States decide for themselves how to reduce their emission reductions, is acceptable in the current economic and political climate. The risk is, however, that this approach will in the end only lead to greater fragmentation in the European energy market, as countries will choose different routes to the same end goal. That could leave EU climate policy in shambles and be a “game-changer” of a different sort for investors. 12% of the allowances in the EU ETS will be channelled off into a reserve every year, starting in 2021, provided there are at least 830 million in circulation. 12% of 830 million is 100 million allowances. If there are less than 400 million in circulation, 100 million allowances will be released from the reserve into the market. If circulation is between 400 million and 830 million, nothing happens. This proposal will need to be agreed by the European Parliament and member states to become law.